Worms 3 ($4.99 Universal) is a turn based combat game where players command a small team of worms and wage war with one another online. With just as much attention to individual game play, this game will have you ready to lead a troop of worms into battle in no time. To start, there are two different controls to choose from: A virtual d-pad with a jump button, and a less than intuitive, original touch screen-based movement that will grow more comfortable as you continue to play. 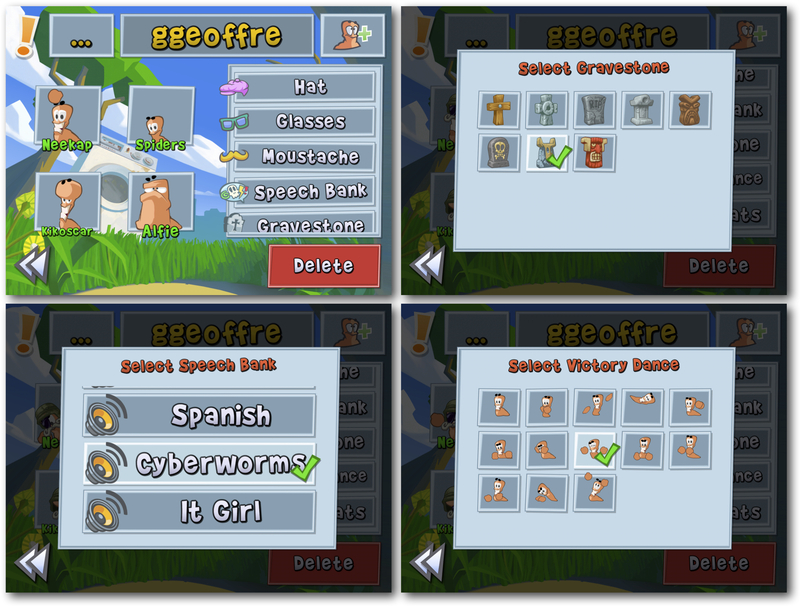 In both scenarios, the options available to the worms during its turn depend on the situation. Sometimes you are moving a targeting scope of a weapon around the screen to take careful aim at an enemy worm, while other times you are controlling the thrusters of a jet pack to fly from one ridge to another. Onscreen tutorials will walk you through the basics as you figure out how to work some of the different battlefield utilities. Before you start out on a campaign of destruction and mayhem, you have to pick the four members of your worm team. You start out by picking some combination of a Heavy, a Scout, a Scientist, and a Classic Soldier. Once you have your team picked, you can customize them right down to their mustache, gravestone and victory dance moves. You can create more than one team to change up how you approach each game. In single player mode there are 30 different missions spread across three different environments; sewer, beach, farmland and a spooky world. There are two additional single player game modes, Quick Game and Body Count that you can play until you feel more comfortable with all of the different weapons and utilities. While you can strive to perfect your game style on your own, the real challenge comes in the form of online gameplay. When a battle begins, each worm will individually take a turn moving around and striking out against the opposing team or teams. You can choose from several different weapon types at the beginning of the worm’s turn. Some of the weapons are the standard sort like bazookas, hand grenades and missiles, while others are more bizarre like Exploding sheep, Buffalo of Lies and even the Holy Hand Grenade. Sometimes movement across the battlefield requires a little assistance. That is when you can choose one of the various utilities to help you get around. There are parachutes, ninja ropes, and jet packs that can get you from point a to point be in style. Once you have decided what your worm will do, you squirm into position, aim and fire. The next team takes their turn and so on until one worm from each team has made a move. You keep rotating through each teams roster until there is just one team left standing, so to speak. Starting out each game you have the option of turning on or off the trading cards feature. 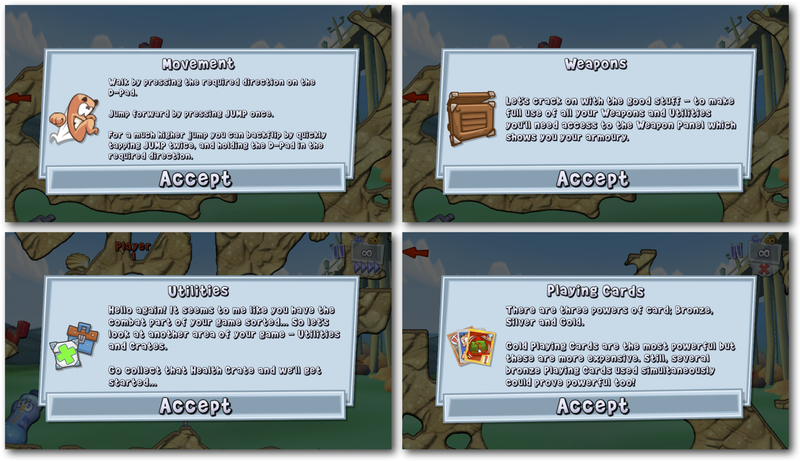 There are three different types of cards, bronze, silver and gold, that have different effects on the game. These cards can change things up by decreasing the gravity, increasing your ability to take damage, or increasing the amount fuel available to the jet packs you may what to use. You can play up to three cards at a time. 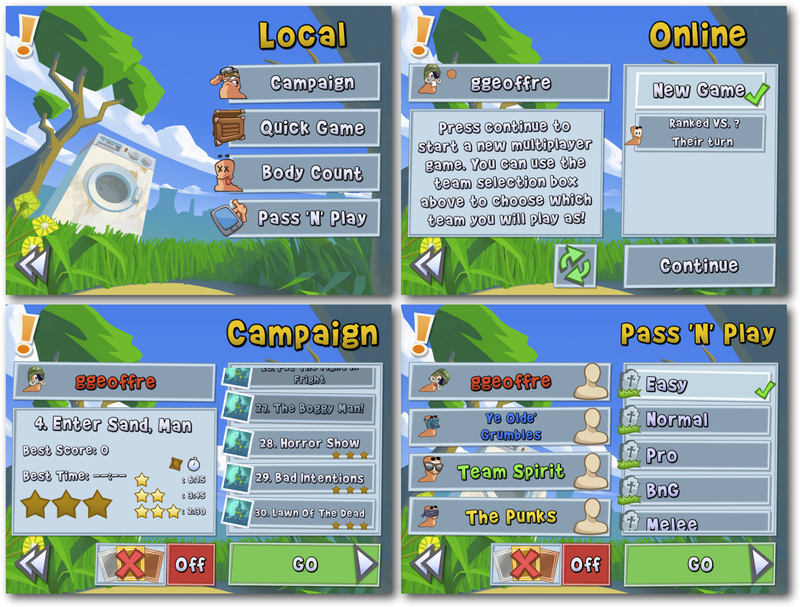 In online gameplay you can have multiple games going on at a time. So the time between each teams turn really is not as instant as you would think. Your real world opponent may not be ready to make their next move just yet. When selecting an online opponent, you can choose between a ranked online game where you will be matched against random opponents, or a friendly online game where you can choose your opponent from your list of online friends. Only the ranked games count for your online standing. One of the exciting aspects of local multiplayer gameplay is how the game utilizes AirPlay through the AppleTV. Up to four players can play together and watch how things play out on the big screen. You do need to pass the device back and forth between players. When setting up a turn, selections are made on the device without revealing on the main screen to the other players exactly what is being planned out. Being a game that have been around for a while, there are certainly many earlier versions of the game that you can play. 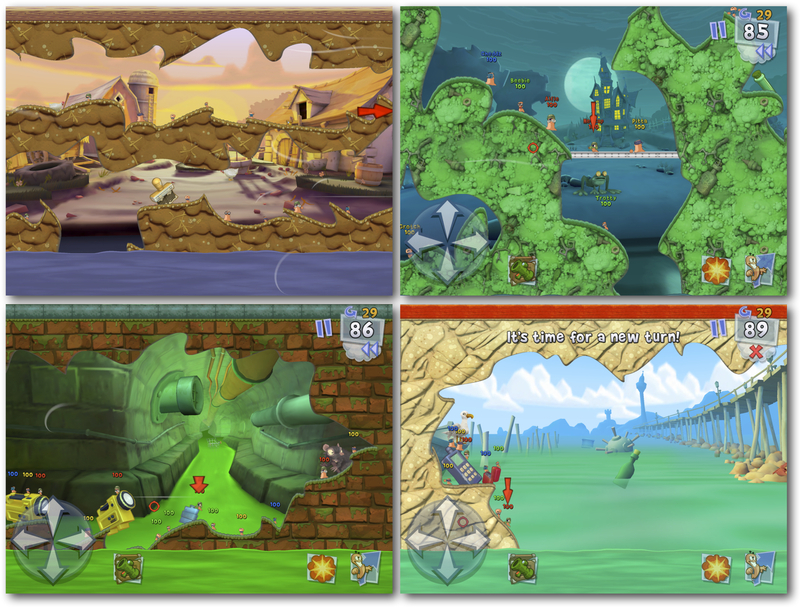 There are even two different versions of the game for the Mac, Worms Revolution ($9.99 Mac) and Worms Special Edition ($4.99 Mac). This is not the weekend to be squeamish. These worms mean business and have no intention on being used as mere fish bait. So pick your platform and dig in.